I participated in a Blogger Activation on behalf of Dad Central Consulting for Coastal Dog. I received a product sample to facilitate my review and to thank me for participating. The weather is warmer and the sun is bright! What that means in my family is that usually my wife and kids are going to be spending more time at a swimming pool and enjoying the warm, summer days and cool, relaxing water. My son is quite the swimmer, but does something that's always bothered me. It's a pesky little thing, but I just never understood why he did it until recently. You see, whenever he goes swimming he'll wear his swim trunks and his skivvies underneath. That is until we found these swim shorts from Coastal Dog Apparel. What I didn't realize was my son didn't like the way most of his swim trunks fit and how they'd chafe his legs when he'd swim. There were days they'd spend the entire day at the pool, so he'd be pretty sore in the evenings when he'd try to sleep. The Coastal Dog trunks have a soft, inner short to fight what the makers call "beach rash". When my son first put them on, he said, "they have sliding shorts inside them!!" What he was referring to were the padded, fitted shorts he'd wear under his baseball uniform. He immediately loved the shorts and didn't complain about any chaffing the entire day at the pool with my wife. These are not "cheap" swim trunks. But let's be honest, those cheap swimsuits are the ones that leave you sore and make you not really want to spend the day at the pool or the beach right? And like the Coastal Dog folks say, "Beach Day Should Be All Day"! The other great thing you've got to keep in mind about Coastal Dog Apparel is that everything is made in America and helps employee people here in America. If that's not enough, 100% of the profits this company makes goes to support charities that focus on helping children. They've got shorts for men and boys in classic solid patterns as well as a Malibu floral print as well. They also have sweet, worn and tattered looking ball caps as well. 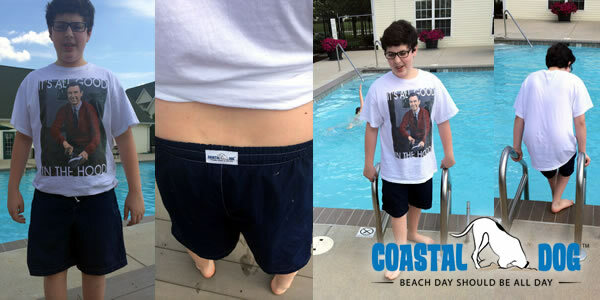 Check 'em out and banish beach rash for you and your boys as well!